In early 2013, Cyclone Oswald tore through huge swathes of eastern Australia, causing some $2.5 billion (AUD) in damage across Queensland and New South Wales. The torrent deposited more than 1.8 million Mg (2 million ton) of agricultural contaminants, sediments, and nutrients into the Moreton Bay, highlighting a critical need for increased flood protection in the area. In the 3 years since the incident, Port of Brisbane Pty Ltd (PBPL) has been hard at work addressing the problem at its source. 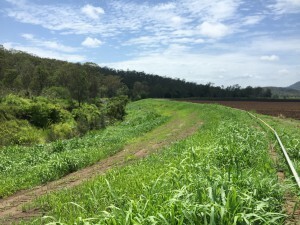 Focusing on a badly-degraded creek bank in the Lockyer Valley, located 100 km upstream from the port, PBPL has collaborated with local landowners, government agencies, engineering firms, and not-for-profit groups with the goal of making the area resilient to major flooding. Made possible by incremental funding totaling $1 million (AUD) by PBPL, program partners replanted more than 4000 native trees and grasses along the Lockyer Valley catchment area. The port also commissioned scientists from local universities and the Queensland government to identify the most pressing sources of sediment pollution in the area, and the most sustainable means by which to address them. A year after initial rehabilitation, workers on the ground noticed the return of flora and fauna to the catchment area. PBPL monitors report that the improvements prevented 3447.3 Mg (3800 ton) of sediment from entering the Laidley Creek, which eventually flows into Moreton Bay. Gradual improvements to the area will continue, with additional maintenance work scheduled to begin in August 2016. For their efforts, PBPL and partners received high recognition at the 2016 Healthy Waterways Awards, held on July 8. The project, which represents the first targeted offsite investment by PBPL, won two awards. First, it earned the Sustainable Water Management Award. Second it earned the Minister’s Grand Prize, which is awarded to the most innovative undertaking across all award categories. PBPL will donate $10,750 AUD in prize money from the awards to Tangalooma EcoMarines (Brisbane), a non-profit educational group that works with schools to protect the environment and wildlife of the Moreton Bay. Learn more about the Lockyer Valley restoration project here.